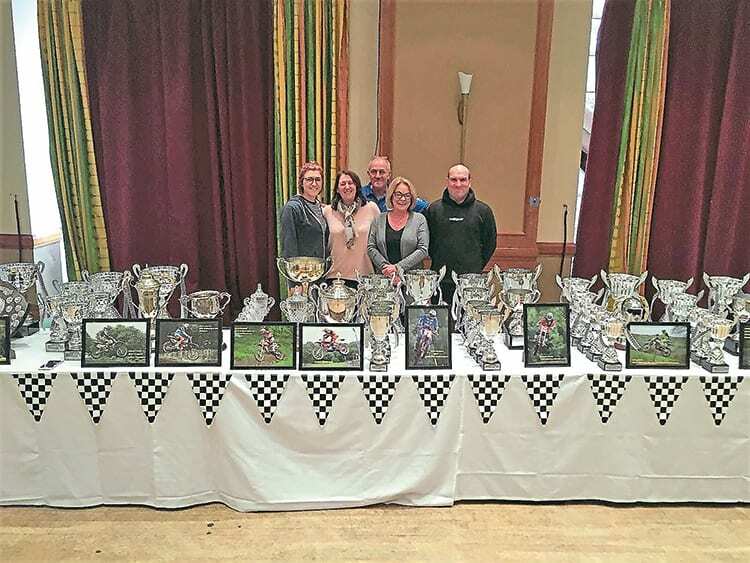 The awards presentation for the Toughsheet National Twinshock MX Championships took place recently at the Moat House Hotel, Stoke, where all the silverware from a successful seven-round series was handed out. More than 150 riders, family and friends attended the evening, and the ones blessed with hair (not many), were able to let it down, and dance the night away. Rob Kinsey was inducted into the Twinshock Hall of Fame, for services to the sport, after 10 years doing the commentaries, but was unfortunately absent after being rushed into hospital the day before. He is now recovering and we wish him well. Peterlee’s Barry Turnbull is the new Wulfsport National Twinshock Champion, and will carry the number one plate in 2018. Thanks went to the Cumbria, Lancashire and Yorkshire Twinshock clubs who ran the events, plus all the superb sponsors, secretaries, lap scorers, medics, marshals and helpers. Read more news in the Winter issue (No.45) of CDB – out now! Toughsheet organisers stand proud after laying out all the trophies.